The Lostprophets latest tour ended last Friday with a full house at the Brixton Academy, completing a spring jaunt which sold out at every venue. The dates accompanied the release of the band's fifth studio album, Weapons, issued on 2nd April. Weapons gets an American release in June and the band are continuing to tour the new material throughout the summer with a variety of festival and live dates ahead of the November tour. Formed around 15 years ago, Lostprophets have come a long way since being conceived as a side-project for another band, Public Disturbance. Nearly 4 million records later, the six-piece from Pontypridd enjoy a cachet of cool all-too-rarely associated with UK nu-metal acts. Four of their five albums have made the UK Top Ten with 2006's Liberation Transmission topping the UK album countdown. The album was their second consecutive Top 40 record in the US and charted well all over the world. 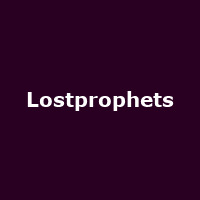 Offering a maturing sound with widening commercial appeal, Lostprophets have grown into one of South Wales' finest exports in the face of stiff competition. Lostprophets kick off their autumn tour in Wolverhampton on Thursday 1st November 2012, followed by dates in Sheffield, Edinburgh, Manchester and more, before the final gig of the run at the Newport Centre on Wednesday 14th November. We will have tickets available from 9am on Friday 11th May, priced £22.50. The band are also playing at the Vans Warped Tour 2012 London date at Alexandra Palace on 10th November - we have tickets available now priced from £40. Ahead of the November dates, Lostprophets are playing Prague City Festival 2012 in the Czech Republic, alongside Blink-182, the All-American Rejects and more. We have tickets available now, priced from around £35.